Nobody wants to feel as if their boss is breathing down their neck all of the time, which is actually one of the reasons why remote working is now seen as more preferable. It increases their anxiety and is actually counter-productive as it makes them much more likely to make a mistake. While an advantage of working from home is that employees can set their own work hours, you still want to feel as if you are involved with the team and can catch and correct mistakes before they happen. This can be trickier if everybody is working at different times, particularly if they are in different time zones. Harvard Business Review recommends setting regular performance goals and agreeing upon a schedule for when you will check in, leaving colleagues to get on with their work at all other times. A scheduled meeting time will make colleagues feel less pressured, but don’t make them feel as if they can’t come to you with problems or questions when they occur. Failure to address issues could cause them to become worse to the point that they might be impossible to fix. Video conferencing small business software can help you to be accessible and approachable at all times, as this type of software works not only on computers but on mobile devices as well. It doesn’t mean you have to be glued to your phone at all times and be kept up all night answering questions, but it will give you an air of friendliness that your colleagues will appreciate. All employees will need to work in a quiet, distraction-free space at certain times. But working this way for too long can feel lonely and isolating. Sending out dozens of e-mails each day doesn’t do much good, as it feels impersonal and makes it difficult to locate a specific piece of necessary information. But failure to communicate can be responsible for a lot of businesses failing. Let colleagues know that they can not only reach you whenever they need but also each other, while still setting boundaries to allow people to work in peace when they need to. Let them know that they can use their conferencing software not only for scheduled group meetings but also for one-on-one talks or even personal chats. These ‘water cooler moments’ talking about personal lives, family, or hobbies is an essential part of forming working relationships. There are no upper limits to how much you can use the software each month so you may as well make the most out of it. Even just keeping a chat window open while working opens up some line of communication. When co-workers aren’t in the same physical location, they can still feel connected and form bonds much as they would in an office. Remote working, even more than an office environment, can make more introverted people feel excluded and overlooked. They may feel more comfortable working by themselves and be more selective about their social interactions, but this can also make them feel less connected to the team and harder for them to express their opinions in group meetings. A good team leader has to make every person feel included while still adhering to how they work best. Be sure to encourage everyone to contribute to group meetings and not let others dominate the conversation or talk over others. Encourage more shy colleagues to come to you or others with problems or even when they just want to chat. If you expect your team to do a good job, you must expect to do something for them in return. One way to do this is to show your appreciation to your team for their hard work, even if it is only a verbal word of thanks. You can also send regular gifts or cards, hold online social events every month or so, or arrange a Christmas party each year. If it is your first time managing a remote team or you have found adjusting to it difficult, you will find that most of the principles are the same as working in an office. If you treat your colleagues with respect, check in with them regularly, and encourage a group dynamic then your remote team will be more successful and productive than ever. If you are a manager running a remote team, it can be challenging. 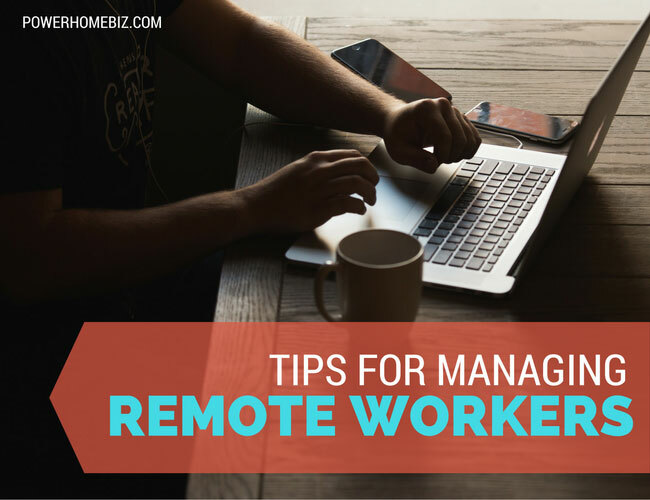 Learn tips on managing remote workers and employees for maximum efficiency and profit.